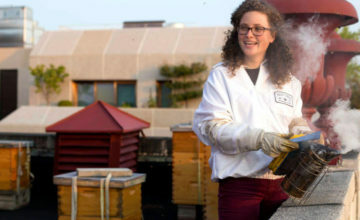 Sarah Red-Laird is the founder and Executive Director of Bee Girl, a nonprofit organization that aims to conserve our bees by educating the public on their importance through programs focused on community classes and events, public lectures, initiatives, and public lands for bees and beekeepers program. 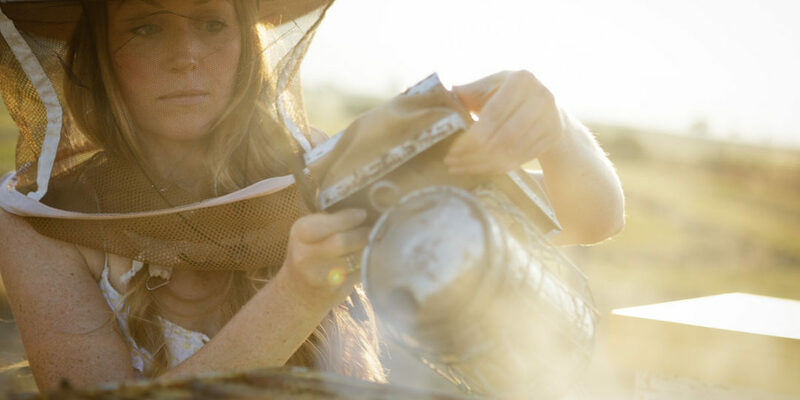 Sarah engages with communities across the nation, and the globe, spreading knowledge and bringing a sense of wonder from the hive to the people. Read more about the Bee Girl organization here. What is your favorite part of beekeeping? Having quiet time with the bees, where the world fades away behind the buzz of the hive. I’m usually with students or taking samples for research while I’m in the hives, so it’s a precious gift when I get some solo time for inspections on a warm summer day. I also love the community around beekeeping, and the travel opportunities I’ve had. I’ve been able to meet and and work with beekeepers, kids, and other people around the world. What is your least favorite part of beekeeping? The competitiveness in the industry, and lack of good collaboration between beekeepers and the rest of the food industry. I do have hope that’s changing with the next generation, though. I think this issue is a frame of mind that comes from scarce resources (lack of great forage, lack of land access, lack of capitol, lack of infrastructure for communication). Also, 10 frame boxes full of honey! It’s time for an 8 frame medium revolution! If we want to do this for the rest of our lives – we need to be thinking about our own health, too. I have zero need to prove anything except for the fact that I love my bees, and want to do this until I’m 90! How did you get into beekeeping? As a student at the University of Montana, under the guidance of Dr. Bromenshenk and Scott Debnam. 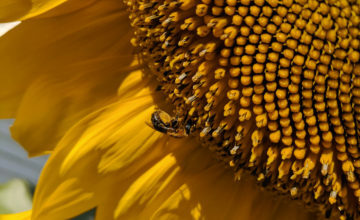 Why do you think it is important to keep bees or do the work you’re doing? Bees pollinate our food, make honey, and keep our wild areas thriving. Bringing our attention to this creates community around the conservation of bees themselves, as well as environmental stewardship. Do you have any of your own hives or family with hives? Yes – I’m currently downsizing from 50 to 22. What is your favorite cool bee fact? That honey has no expiration date! Honesty time: are you afraid of bees? Not one bit. Would you rather be a queen bee or a worker bee? A scout bee! If I could just travel and dance for a living, I’d “bee” in heaven. Have you ever dated another beekeeper? Nope. Do you have a favorite beekeeping location? Yup – our vernal pool restoration and research site near Table Rock and the Rogue River in Southern Oregon. What is your advice for young people interested in beekeeping who may not have the space or money to start keeping bees on their own? Join a beekeeping club or association. Volunteer to keep the clubs’ hives. Ask for an internship with a beekeeper or beekeeping business or organization. Start a beekeeping club at your school or university, and fundraise for suits, gear, hives, and bees. Start creating a community around your love for bees, and the bees will appear in your life, in one way or another.